I used to have Aperture setup to import photos when my camera was plugged in, but now I have a GPS that I take on photo trips, I need a new workflow. Sigurd Buchberger at ScriptaMac.at makes two Automator plugins. One for importing data from a GPS unit or a GPSx file, the other for geo-tagging images with the GPS track data. 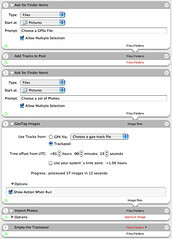 Here is a screen shot of my Automator Workflow. It gives you an idea of the kind of thing you can do. The other option I am looking at is a Workflow that reads straight off the GPS and reads straight off the Camera, which would be triggered by plugging the camera in. I’d need to plug the GPS in first, and use two USB ports.